You only need 15 minutes, less than 10 ingredients, and a blender to make this uber creamy and satisfying vegan alfredo sauce recipe! Vegan and gluten-free. When I want to get a satisfying and delicious dinner on the table super quick, my go-to is always pasta. I used to just reach for a jar of pre-made tomato sauce but I’ve been trying to eat less processed foods lately, so I created the most delicious and easy to make creamy vegan alfredo sauce (cashew-based)! This is my #1 favorite pasta sauce recipe and I know that as soon as you taste it you’ll love it too. Learn how to make pesto sauce that’s VEGAN, super creamy, and loaded with flavor! Plus, variations to make it oil-free + a recipe for our favorite 15-minute pistachio pesto pasta! The first time I tried pesto pasta was at Maggiano’s when I was 17 (I know, how did I go so long without trying it?!). At first, I was a little hesitant to taste it because it was so…green. However, I did try it and I fell in love with pesto after that first bite! I loved the bright flavor of the basil mixed with the tangy parmesan and the buttery pine nuts combined with hot noodles…ohhh be still my beating heart! After that, I taught myself how to make pesto sauce at home and I started trying all kinds of substitutes for the pine nuts because they are very expensive. Cashews, almonds, walnuts, and pistachios are all great substitutes for pine nuts in pesto. I’ve also used pumpkin seeds in a pinch and that was yummy too. The only version I didn’t love was pesto made with hemp seeds, it just had a weird flavor that I couldn’t mask with other ingredients. When Travis and I transitioned to a vegan lifestyle, I thought that I would have to give up pesto because we couldn’t eat dairy anymore. I wondered if pesto would still be as delicious without the parmesan cheese? Great news, it’s still delicious! After trying a bunch of vegan pesto ingredient variations, I’ve found that learning how to make pesto that’s vegan is SO simple– and it’s really not that much different than the regular version. This is the BEST vegan garlic aioli you’ll ever taste! It’s so creamy, garlicky, and lemony; it’s the perfect flavor combination! You’re going to want to slather it on everything! Vegan, gluten-free, nut-free. I don’t like mayo. I never have, and I never ever thought that my taste buds would change after 29 years! We never had mayo in the fridge when I was growing up, I never put it on sandwiches, dipped my fries in it, or anything else you use mayo for. I avoided mayo at all costs until…I had the Holy Shiitake pizza at Mellow Mushroom; whole wheat crust pizza with three types of sauteed mushrooms, caramelized onions, and creamy garlic aioli sauce. Each bite is like heaven in your mouth! The garlic aioli sauce is creamy, garlicky, lemony… dang delicious! It’s nothing like what I expected a mayo-based sauce to taste like. It’s super flavorful and takes all the flavors of the pizza to the next level! Then I went vegan and I couldn’t get my favorite pizza anymore. Well, Mellow made a vegan version of the mushroom pizza but it really needed the garlic aioli. It just wasn’t the same. What’s a girl to do? Make a vegan garlic aioli, of course! 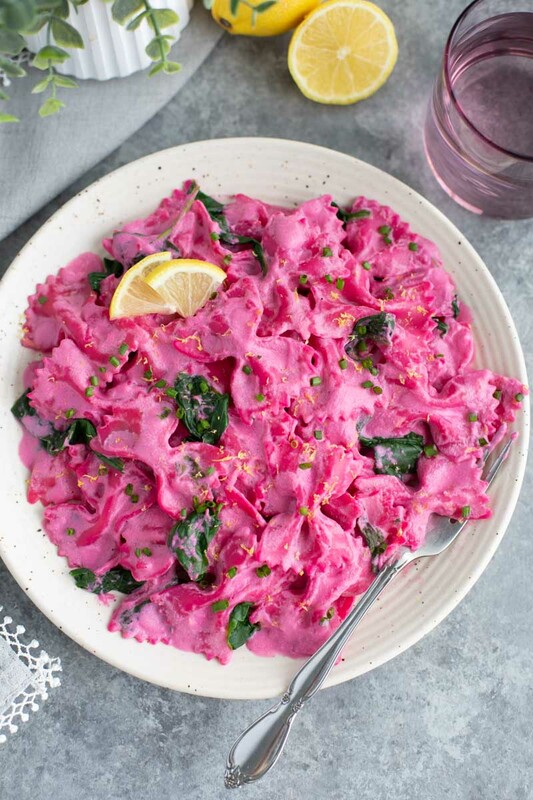 Toss your favorite pasta with spinach and creamy cashew vegan beet pasta sauce that gets its unique pink color from roasted beets. Topped with dollops of sun-dried tomato cashew cheese and green onions. This quick and colorful dinner is perfect for Valentine’s Day, spring or summer! Dairy-free, vegan. I’m baaacckkk and I’m now a Mrs.! I took a few weeks off from blogging to get ready for our wedding, to celebrate, and to relax after. The husband (I love saying that!) and I aren’t going on our honeymoon for a few months because we wanted to wait for better beach weather but skip the peak times of spring break, so we took a quick jaunt up to Disney World to celebrate being newlyweds. Make sure you check back next week for our review of this year’s Epcot Flower & Garden Festival! I’ll be sharing everything about our wedding in an upcoming post. When I say everything, I mean everything! The planning process – Why it’s so stressful and tips to save your sanity! What traditions we did and didn’t follow on our wedding day. Our vendors – Do you really need a videographer? Which is better, buffet or sit down meals? Is it worth it to upgrade to the fancier chairs? How do you pick the right photographer for you? My dress, where I got it and how I knew it was the one! Why I think all couples should 100% do a first look! The ONE thing we wish we would’ve done differently at our wedding. Our stunning venue + my honest review of having a wedding at an all inclusive venue. What you should cut corners on and what you should splurge on. Should you DIY or buy it new? I have the answers to all of your burning wedding questions! I’ll also be sharing our wonderful pictures and wedding video from one of our favorite vendors —> Rad Red Creative.